Moles are common skin growths that vary in size and color. They are typically benign. Rarely, certain moles give rise to melanoma, the most dangerous type of skin cancer. Benign moles that are aesthetically displeasing or become repeatedly irritated can be removed during a quick in-office procedure performed by one of our medical providers. 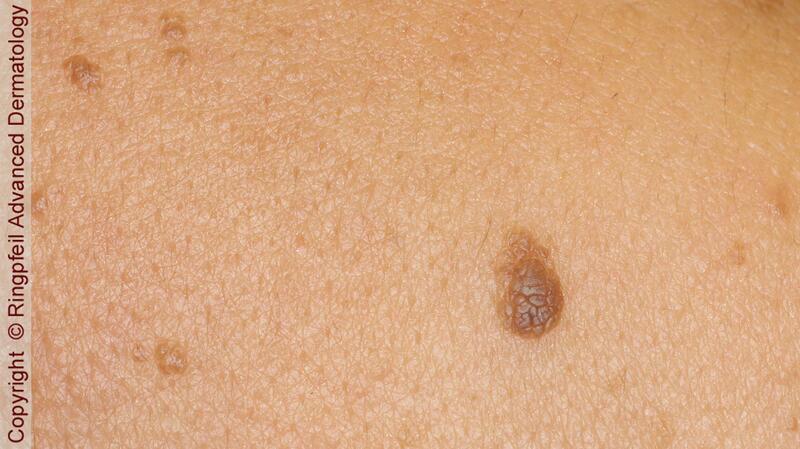 A mole, scientifically referred to as a “nevus,” is a common growth that arises from pigmented skin cells. Moles can be brown, red, or skin-colored. They typically form on the skin before birth or between birth and young adulthood. However, a new mole can occur at any age. Annual full body skin examinations and monthly self examinations are recommended for all adults to monitor new moles and changes in old moles. The 4 most common types of benign moles are congenital moles, acquired moles, Spitz nevi, and atypical moles. Congenital moles are the type of moles that are present on the skin at birth, while acquired moles are the type that appear after birth. Individuals with light skin are more likely to develop acquired moles in their lifetime. Spitz nevi usually occur during the first 20 years of life and can be raised, various shades of red and/or brown, and sometimes bleed. They may look similar to melanoma because of these uncommon attributes. Atypical moles, also called “dysplastic nevi,” are moles that have unusual features on the skin and under the microscope. Although some Spitz nevi can have uncommon features, an increased risk of developing melanoma is only associated with atypical moles. Therefore, complete removal of atypical moles is always recommended by our practitioners. Elective removal of congenital moles, acquired moles, and Spitz nevi can be achieved with shave removal or complete excision. Both procedures are performed under local anesthesia. Shave removal eliminates the portion of the mole that is above the skin and leaves a flat circular scar that may be lighter or darker than the natural skin tone. With shave removal, there is a 50% chance of recurrence of the mole. Excision removes the entire mole to ensure that there is no recurrence. It requires sutures and results in a linear scar.